We maintain at least 12 articles in document format conversion topic between Microsoft Office, LibreOffice, and PDF. We divide the tutorials into 4 division with 3 tutorials for each division. Every tutorial is done with LibreOffice command line and in the multiple conversion mode, in GNU/Linux. 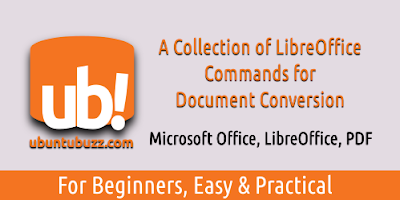 We create these series of tutorial to ease every migration from Microsoft Office to LibreOffice. We included coversion to PDF here just to ease everyone from the incompatible formats, because PDF is better than OOXML if you want to read it in every computer. We hope this series help you a lot. ODF: OpenDocument Format. Consists of odt, ods, odp. MBF: Microsoft Binary Format. Consists of doc, xls, ppt. OOXML: Microsoft Office Open XML. Consists of docx, xlsx, pptx.